If I offered you immortality, would you take it? 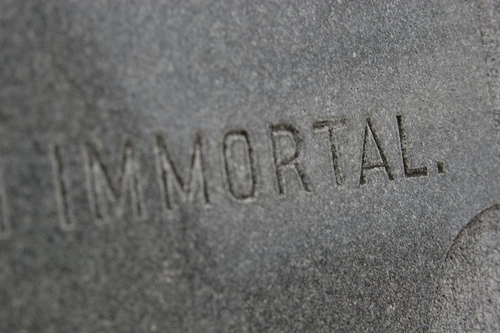 I think in a way, many of us are already pursuing an immortality of sorts. Perhaps it’s on the small scale, but I wonder if our passion for user-generated content (or whatever you want to call it) is part of our desire to create our own immortality. Is that what all our bytes of data are about, achieving a type of immortality? Faulkner’s idea of arresting motion seems to fly in the face of a world that seems constantly in motion. So are we leaving anything behind for strangers a 100 years from now to put into motion? Are we creating things worth reviving in the decades and centuries to come, or are we so busy producing that we’ve lost sight of what we’re trying to accomplish? The last three days have been a perfect storm of client projects, thus no blog posts since last week. This imbalance in my life triggered the notion that we place a lot of emphasis on having balance in our lives. Balanced diets, balanced checkbooks, balanced opinions. We even use scales and a blind woman to represent justice. I’d pose that balance doesn’t truly exist and that our pursuit of so-called balance only leaves us wildly out of whack. For instance, my fear of not having written a blog post since last week (mustn’t blow the schedule even more) had me writing a draft of this post (see below) while my hairdresser cut my hair. I strongly suspect that I’m not the only one who questions what living a balanced life requires and the cost it exacts. Failing to recognize this fact falls in the same category (IMO) as saying that women can have it all with no caveat added to address the good and the bad (that’s another discussion). 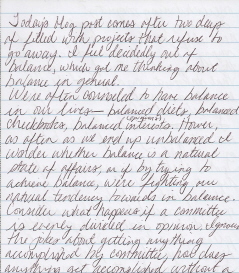 Balance is also equated to neutrality (see: scales of justice), which I find equally ridiculous, if admirable in aim. For instance, Fox News makes a point of saying “fair and balanced.” Please, hold the laughs for a moment. The bigger question isn’t whether they’re honest or not when they say this but rather why network executives assume viewers want “fair and balanced” in their news? Am I too cynical when I say that I believe no one individual or entity is capable of true balance or neutrality all of the time? Last I checked, humans, including reporters, aren’t exempt from all the quirks of humanity, including personal opinions. Would we like/respect the press more if we knew what personal biases might be in play? Coming back to balance in our lives…some weeks, I will physically (and mentally) not be able to keep my posting schedule of five per week, but that won’t stop me from trying to meet my goal. Maybe this idea is the true definition of balance. As Marc Andreessen points out, “There’s always more demands than there’s time to meet them, so it’s constantly a matter of trying to balance them.” (link) The other thing I’d add—try spending more time weighing the value of the demand versus the time it requires. Few scales will ever truly balance. Perhaps they aren’t supposed to. Who decided that day was, well, day, and night was night? Let me phrase it another way: who decided that day was when things got done and night was when we slept? I’m a night owl. More accurately, I function better during the twilight hours. However, for business reasons, I push myself to conform to the standard hours that most of my clients observe. Frankly, if you’ll pardon the pun, there aren’t enough hours in the day to get things done. Recent stories about delays in the airline industry pointed to three big issues: (1) antiquated air traffic control systems; (2) bad weather; and (3) increased passenger traffic. There’s one other factor that gets mentioned regularly—airlines are trying to takeoff and land at the choicest times, creating a logjam on the runways. Ideal times only exist because we’re forcing our days—and our lives—into a box. Long-distance travel will become simpler with decimalisation…Decimalisation will ease the problems of jet lag by cutting the number of time zones. Dividing the 360º globe into 24 means having bands that are are just 15º wide. This gives the continental United States (without Alaska) four time zones; the Soviet Union an absurd 11. A ten-hour system calls for 36º bands, yielding just two zones for America and five for Russia. Beyond switching to metric time (which makes for interesting conversation), I wonder why we’re so resistant to utilizing the entire clock. There’s 24 hours. Subtracting your minimum 8 hours of sleep, that leaves 16 hours that could be placed anywhere on the clock. We assume that certain functions need to be performed on a 24-hour basis (hospitals, police, firefighters, etc.). Why doesn’t the rest of society function that way too? Consider the market exchange systems throughout the world. The Asian markets are functioning while American markets are tucked away for the night and vice versa. How would it change the industry if the markets overlapped even by a few hours? Since I’ve gone from a traditional 8-5 schedule to a more flexible schedule, I know I consistently work more hours and later into the evening. However, my work is better, and I’m doing amazing things with my time. Given that time is finite, I hope we can become smarter about how we use it and understand that the way we’ve managed it to date may not be possible in the future.